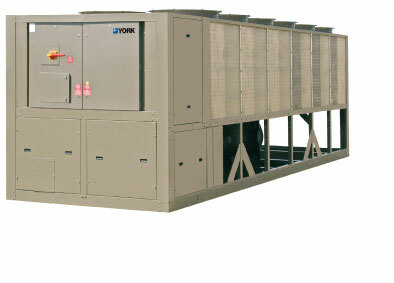 YORK YVAA model air-cooled chillers provide superior performance. Higher efficiency heat exchangers coupled with variable speed operation and smart controls elevate the system efficiency to a whole new level. The resulting benefit from YVAA chillers is much greater than the sum of its parts. YVAA air-cooled chillers are completely assembled with all interconnecting refrigerant piping and internal wiring, ready for field installation. The unit is pressure tested, evacuated, and fully factory charged with refrigerant R134a and oil in each of the independent refrigerant circuits. After assembly, an operational test is performed with water flowing through the evaporator to ensure that each refrigerant circuit operates correctly. Offering flexible energy consumption, the YVAA chiller can be configured to offer design efficiency up to 11.6 EER, and an integrated part load value (IPLV) up to 19.8 EER. 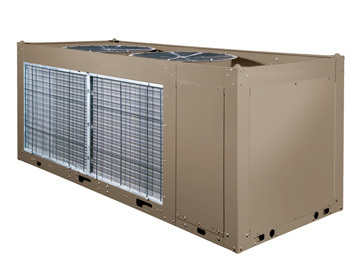 The chiller uses HFC-134a refrigerant, which has no phase-out date and an ozone-depletion potential of zero. Fewer joints and potential leak points keep the refrigerant inside the chiller. A proprietary falling-film evaporator and advanced microchannel condenser coil reduce the refrigerant charge by as much as 15 percent. Installation of the YVAA chiller gives building owners the opportunity to earn points in the Leadership in Energy and Environmental Design (LEED®) green-building certification programs. Standard YCIV with standard capacity control. Standard YCIV with optimised capacity control. High efficiency YCIV with standard capacity control. High efficiency YCIV with optimised capacity control. 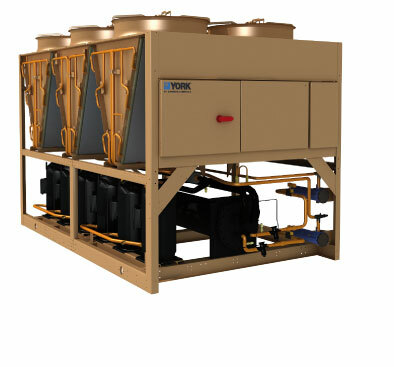 With cooling capacities from 177 kW to 521 kW, the YORK YLAA TEMPO air-cooled chiller is an environmental leader.The YLAA utilises scroll type compressors and microchannel condenser coil technology to deliver premium efficiency for all air conditioning applications. YLAA chillers are a self-contained cooling solution that is light-weight and compact for convenient installation on the ground or on building rooftops. YORK Air-Cooled Scroll Chillers provide chilled water for all air conditioning applications using cen- tral station air handling or terminal units. They are completely self-contained and are designed for outdoor (roof or ground level) installation. Each unit includes hermetic scroll compressors, a liquid cooler, air cooled condenser, a charge of refrigerant R-410A, and a weather resistant microprocessor control center, all mounted on a rugged, formed-steel base.